World demand for motorcycle components, including those for electric bicycles (e-bikes) and motorcycles (e-cycles), will grow 7.5 percent annually to $119.5 billion in 2017. Engine and drivetrain parts will remain the largest category, while tires will grow the fastest. The Asia/Pacific region will remain the dominant market. 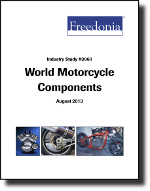 This study analyzes the $83.2 billion world motorcycle component industry. It presents historical demand data for 2002, 2007 and 2012, and forecasts for 2017 and 2022 by market (OEM, aftermarket), product (e.g., engine and drivetrain, tires, structural components, electrical and electronic components), world region, and for 20 major countries. The study also considers market environment factors, details industry structure, evaluates company market share and profiles 51 industry participants, including Bajaj Auto, Harley Davidson and Hero MotoCorp.